Im trying to setup the 4.0 1click server from dwarf. When i start setup i use CC:1 because im using the Na client, then i enter 10 because i think this is about creating ur own characters, then i press 0 untill i get the message fiished! now u can play the 1 clickl starter.bat then it creates a Z drive and run 3 seperate windows game/login/game. "java is not recognized as an internal or exsternal comand, operable program or batch file"
any1 can say me what is wrong there? how to promote characters to be a gm with the //promote command? How can i create an acc? 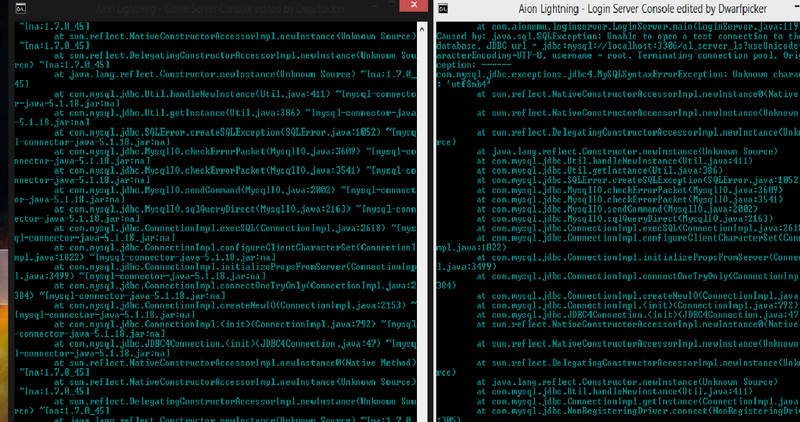 - [Win 8] NoIP FiX for Aion 4.0 (Needed by AL 4.0 Core) Could you fix it's link ? I get page not found. hi edited my account into admin but i cant use any gm commands? is there i need to do after editing account in navicat?